Artist Ilana Harris-Babou working in New York, 2018. Ilana Harris-Babou invites me to tag along to the grand opening of Restoration Hardware in Manhattan’s Meatpacking District on a research expedition of sorts. This past winter, the Brooklyn-born performance and video artist mounted a gleefully sardonic parody of the luxury furniture store called “Reparation Hardware,” at Larrie gallery. Using modes like the word play found in the title, “Reparations” dealt with the design world’s obsession with taking what’s old and making it new again. “It’s this idea that you can curate the world, and bring difference in,” Harris-Babou says, “and that it is controlled by the taste-making, omnitiate eye of the furniture, which grounds itself as modern, centered and white.” This comes to light in a video piece where Harris-Babou seductively caresses repurposed wood in an artfully crumbled New England barn. “I like to use humor and familiar forms as a Trojan horse to get heavier material into people’s line of sight,” says the artist. 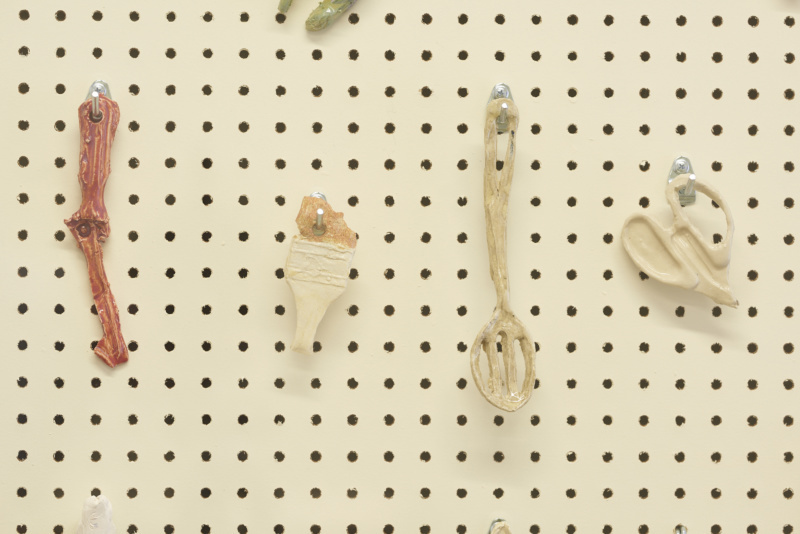 Harris-Babou’s Untitled Pegboard (detail), 2017.